A Prolific Works giveaway can be shared with readers and allows them to claim and read your freebie. Prolific Works giveaways can be created after you have uploaded a book to your Prolific Works Dashboard. You will be able to create an unlimited number of giveaway campaigns and distribute an unlimited number of freebies, whether these be previews, novellas, or full-length books. 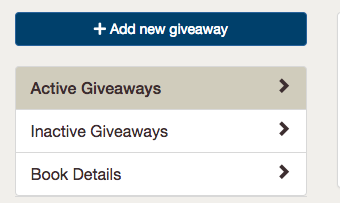 To create a giveaway, click on a book on your dashboard, then select "Add new giveaway." You will be presented with three options, "Reach New Readers", "Share Privately", and "Custom." 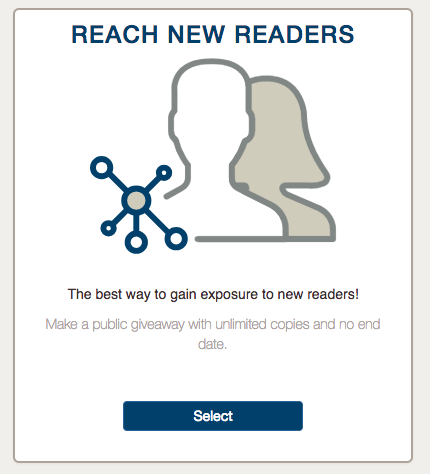 The "Reach New Readers" option allows you to create a Public giveaway that Instafreebie will be able to share with new readers. If you want to reach new readers, continue to "Creating a Outreach Giveaway". The "Share Privately" option will allow you to create a Private giveaway that can only be accessed by people with which you shared the link. This makes it perfect for sharing with reviewers, editors, ARC readers, contest winners, and Street Teams. If you want to create a private giveaway, continue to "Creating a Private Giveaway". Custom giveaways allow you complete control over the options for your giveaway. If you want to create a custom giveaway, continue to "Creating a Custom Giveaway"
The "Reach New Readers" option allows you to create a Public giveaway that Prolific Works will be able to share with new readers. If you want to reach new readers, continue to " Creating a Outreach Giveaway". 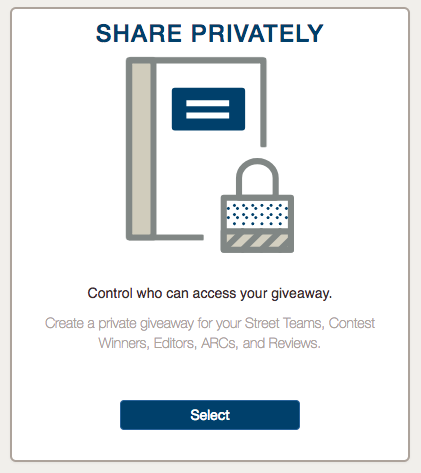 The "Share Privately" option will allow you to create a Private giveaway that can only be accessed by people with which you shared the link. This makes it perfect for sharing with reviewers, editors, ARC readers, contest winners, and Street Teams. If you want to create a private giveaway, continue to " Creating a Private Giveaway". Custom giveaways allow you complete control over the options for your giveaway. If you want to create a custom giveaway, continue to " Creating a Custom Giveaway"
Outreach Giveaways will be your main tool for finding new readers and growing an engaged audience. These are public giveaways that any reader can access if they have the link to your claim page or find on your Author Page. There are two options for creating Reach New Readers giveaways: optional opt-in and mandatory opt-in. 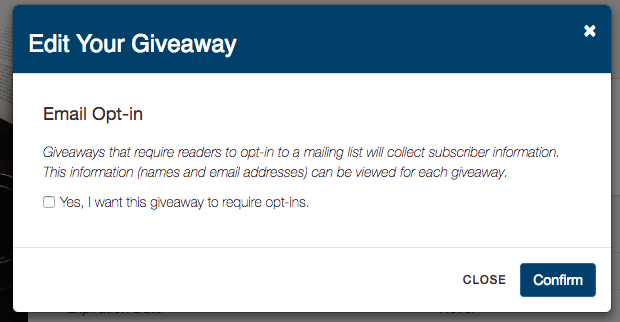 Optional opt-in means readers can choose whether or not to sign up for your newsletter when they download your book. If you select this option, readers will also be able to find your books through Instafreebie’s search engine (coming soon!) and our newsletter, social media, and homepage promotions. Mandatory opt-in means readers must sign up for your newsletter to download your book. These giveaways are no longer promoted through our newsletter, homepage or social media channels, to better comply with the recently passed GDPR regulations. 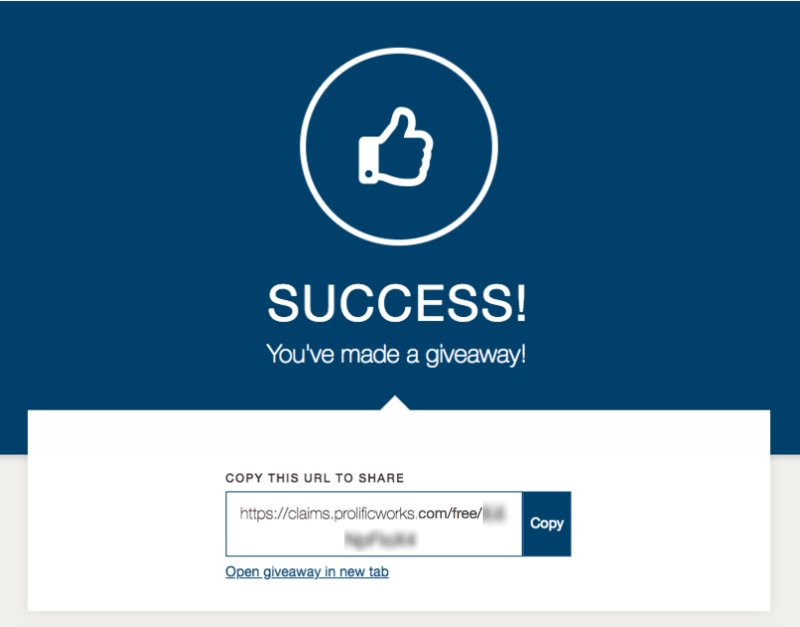 Click on the book you want to create an Outreach Giveaway for and select "+Add new giveaway". Click on the button labeled "Select" in the "Reach New Readers" box. If you want to name your giveaway, enter the title in the box under "Giveaway name". Note: Giveaway titles will not be seen by readers. This is an organizational tool that is helpful if you have multiple giveaways for one book. They appear on the book page (found when you go to your dashboard and then select a book) under the "Active Giveaways" section above the link for each giveaway. If you are integrated with a mailing service, select which list you would like this giveaway to send email addresses to under "Book Details". This means that when a reader opts into your mailing list by downloading your book, they will be added to the selected list. If your book is exclusive to Prolific Works, select the box next to "Yes, this book is exclusively on Prolific Works". Note: If your book is available for purchase on another platform but is only free on Prolific Works, it is not exclusive. The above giveaway is completely exclusive to Instafreebie. Select whether you want your giveaway to be mandatory opt-in. Mandatory opt-in requires readers to sign up to your mailing list in order to download your book. If you want mandatory opt-ins, select the box that says "Yes, I want this giveaway to require opt-ins". If you don't want mandatory opt-ins (based on best practices from email marketing services, Prolific Works recommends not using mandatory opt-ins), unselect the box. Note: Selecting mandatory opt-in may increase rates of reader unsubscribes and spam reports. You will be brought to a page reading "Success! You've made a giveaway!". This page confirms that you have created your giveaway. You will see the link you will share your giveaway with in the box. 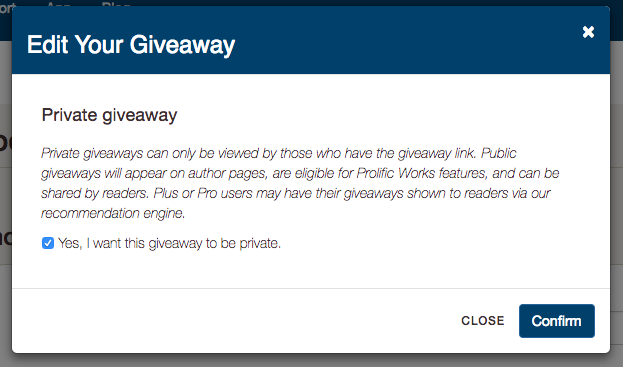 Click "Copy" to paste it into a new window to be brought to your giveaway's claims page. You can open the giveaway page by selecting "Open giveaway in new tab". Privately Giveaways can only be accessed through a page link that you control - they’re hidden from our recommendation engine and are not promoted on any of our channels. These giveaways are perfect for sending Advanced Reader Copies, exclusive sneak-peeks, limited access beta versions, and other rewards to your mailing list. They are protected by a password. Click on the button labeled "Select" in the "Share Privately" box. Click on "View & Edit Giveaway". The "Distribution Limit" allows you to decide how many copies are available. This will allow only a certain amount of people to claim and download your freebie. Once that amount of books have been claimed, the giveaway will automatically expire. You can also give away an unlimited amount of copies, which will allow anyone who has access to the link to claim the giveaway. Limit the number of copies by entering a number in the box under "Distribution" or select the box next to "Unlimited copies" in order give away an unlimited number of books. The above giveaway only allows the giveaway to be claimed 500 times. The above giveaway allows the giveaway to be claimed an unlimited number of times. Set the Expiration Date for the giveaway. The giveaway will automatically expire on this day. In order to select an end date, make sure the box next to "No expiration date" is empty, and click in the box labeled "Set end date". A calendar will appear. 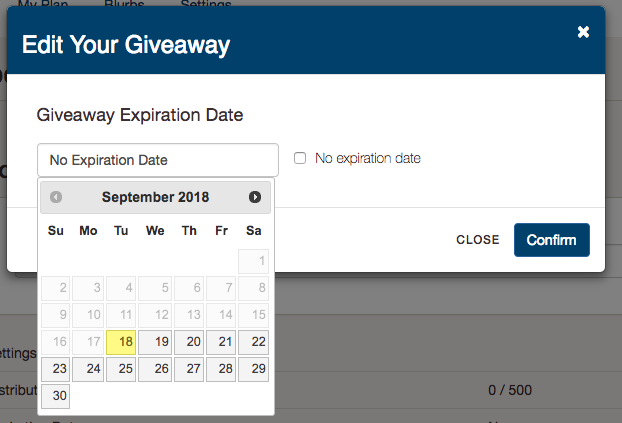 Select the day you want the giveaway to expire. Move between different months by select the arrows on the top right and left corners of the calendar. If you don't want this giveaway to expire on a certain date, make sure the box next to "No expiration date" has a checkmark in it. The above giveaway will not expire on a certain date. If your book is an advanced copy, select the box next to "Yes, this book is an advanced copy". Advanced copies are copies of books that are being shared before they have been officially released or published. If you are integrated with a mailing list, select which list you would like this giveaway to send to. This means that when a reader opts into your mailing list by downloading your book, that is the list they will be added to. If you want to set a password for the giveaway, enter the password into the box that reads "Optional: Set a giveaway password" under "Password". If you set a password, readers will have to enter this password in order to access your giveaway. You will be brought to a page reading "Success! You've made a giveaway!". This page confirms that you have created your giveaway. 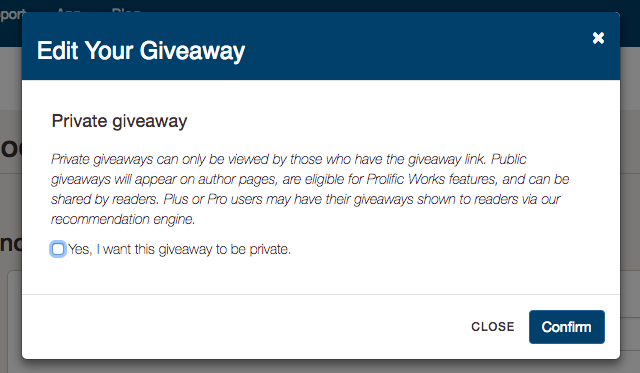 You can copy the link to your giveaway page by selecting "Copy" next to the giveaway link. Custom Giveaways let you customize every feature of your giveaway, such as the number of distribution copies, giveaway expiration date, and more. Click on the button labeled "Select" in the "Don't like these options? Customize every feature of your giveaway". If you want to name your giveaway, enter the title in the box under "Giveaway name"
The "Distribution" section allows you to decide how many copies are available. This will allow only a certain amount of people to claim and download your freebie. Once that amount of books have been claimed, the giveaway will automatically expire. You can also give away an unlimited amount of copies, which will allow anyone who has access to the link to claim the giveaway. Set the limit of books in the box labeled "Set # of copies" under "Distribution" or select the box next to "Unlimited copies" in order give away an unlimited number of books. Set the end date for the giveaway. The giveaway will automatically expire on this day. The above giveaway will not expire. This is a giveaway that does not require opt-ins in order to download a book. Let Instafreebie know why you created a custom giveaway by entering the reason you did in the box labeled "Optional: Tell us why you chose custom!" under "Reason". This will help Instafreebie better understand our users and enable us to enhance the giveaway creation process. Enable which file types are available to readers. If you want a file type to be available, make sure the box next to the file type has a check mark next to it. Note: If certain file types are unavailable, fewer readers will claim and read your book. Instafreebie only recommends restricting file types if the formatting for your book does not function in a certain file type. If your book is exclusive to Instafreebie, select the box next to "Yes, this book is exclusively on Instafreebie". Note: If your book is available for purchase on another platform but is only free on Instafreebie, it is not exclusive. If you want your giveaway to be private, select the box that reads "Yes, I want this giveaway to be private". Private giveaways are only available to people who you have given your link to, and will not be promoted by Prolific Works. The above giveaway is a Private Giveaway. The above giveaway is a Public Giveaway. On your dashboard you can see what books you have uploaded. Select the book that you want to share. You can see the giveaways you have created under "Active Giveaways". The links in the boxes starting with www.prolificworks.com/free will be the links you share with readers. Each link has a specific code at the end to make it a unique link for readers. Share the entire link with readers on social media, in newsletters, emails, etc.